A friend of mine asked me for help because her daughter was struggling to learn her spellings. She was trying hard each week, but only getting 1 or 2 out of 10 in her spelling tests, and it was really upsetting her. The recommended method for learning spellings is Look Cover Write Check (First of all look at the word really carefully. Notice the shape of it – how many letters have ascenders (sticks going up like in b and h) or descenders (sticks going down like in g and p). Notice which letters make each sound (is it ee ea or ie). Close your eyes and try to see the word in your head. Now cover the word and then write it. Check it to see if you got it right) and for most children this works. However some children need to learn spellings in a different way, and my friend’s daughter was one of these. The first thing I did was to move the spellings away from the paper. We used magnetic letters to put her words on the fridge and then we were able to move the letters in the words further away from each other and closer together to look for patterns. By doing this, we were able to see groups of letters that were the same in all of the words, double letters, and words within words (eg together is to get her). We then practised the spellings using different media, such as scrabble tiles, different coloured chalks on paving slabs, finger paints on different coloured paper, and water squeezed out of a bottle. We also used an alternative to Look Cover Write Check which I picked up from a trainer on a training course run by the British Dyslexia Association: Watch Trace Copy Write Check. First she watched me write the word in cursive (joined up) writing, then she traced over it, feeling how the word flowed from the pen. Cursive writing is important as it in brings in muscle-memory. As she traced the word she said it aloud, sounding out the letters. This made it a multisensory experience because it combined seeing, hearing and doing. After this she copied the word, again saying it aloud and using cursive writing. After copying the word a few times, she covered it and wrote it from memory, still saying it aloud and sounding each letter as she wrote it. Finally she checked the word to see if she had written it correctly. Another tip I picked up on the BDA course was to tick each letter in the word that is correct, even if the word as a whole is wrong. This helps to reinforce all the parts of the word that are right, before going back to Watch Trace Copy Write and Check. and grouped all the same coloured words together. This meant that when she tried to picture the word in her head to write it down, the colour would stand out and help her remember which two letters she needed. It also helped us to find patterns and rules. For example we found that the sound at the beginning of a word was usually made with ea: eager, each, easy, whereas ey came at the end of the word. 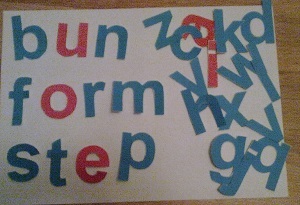 Another visualisation technique we used for particularly tricky words, was to throw the word at the wall. She looked at the word on paper, noting patterns of letters etc, and then ‘picked up’ the word from the page and ‘threw’ it at the wall opposite. From then on, every time she struggled with that word she would look at the wall and still see it there. I have heard of a similar technique from a dyslexia trainer who suggested writing the word on a piece of paper and sticking it on the wall in the corner towards the ceiling. To begin with the children copied the word from here. Interestingly, even after the paper was removed, the children would still look towards that spot when trying to spell the word, and they would write it correctly. My friend’s daughter stopped getting 1 or 2 out of 10 and started getting 9 or 10 out of 10. She still finds spelling difficult, maybe she always will, but she has improved – a lot. Her teachers now give her praise for the amount of effort she puts in. She has strategies now to help her spell words. Spellings homework has stopped being a time for battling with nonsensical groups of letters and of tears of frustration, and started being a time for having fun with words. She’s a lot happier and more relaxed about writing these days. And that’s why I really love my job. For maths or English tuition in the north Birmingham, Sandwell and Walsall area visit www.sjbteaching.com. For links to other interesting education related articles, come and Like my Facebook page. Next PostNext F is for….